She was a wiry girl, which worked out well because she was born into a household of boys on a windswept hillside on the Wasatch Range of Utah, north of Salt Lake, close to almost nothing. The tiny town was nothing but a few houses, the same number of outhouses, a store, the school and the LDS Church. They were almost all Mormons. 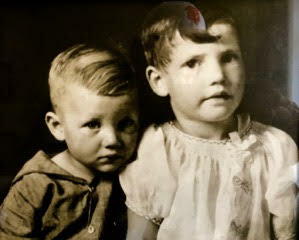 When a family of Catholics moved in down the road, my mother and her brothers beat up the children. They didn’t know what else to do with them. Her father preached in the church, played drums in the town band and coached the basketball team, which mostly played against a team from the reservation 15 miles away. He and my grandmother made their living working sheep, which meant long weeks away from home, sometimes as far away as Montana. The kids got along under the watchful eye of a great aunt. My mother’s father died of cancer before he turned 40, which ended the sheep runs. Grandma went to work at an Army installation way off in Ogden, coming home weekends. That’s where she met her second husband, an about to be sprung G.I. from Wisconsin with enough money in his pocket to buy a little farm in the San Joaquin Valley of California. They took off when my mother was 15 and said they’d send for the rest of the family later. The arrangement didn’t last long. The great aunt wasn’t all that great. So before her 16th birthday, my mother smashed her piggy bank and bought a Greyhound ticket west. When she arrived in Tulare County, she found the police station, described her mother and new stepfather. With little to go on, the police chief puzzled out an answer and delivered my mother to the little farmstead. The brothers joined the little clan after a few months. High school was uneventful, junior college as well until she met my father, a Navy man and, as it turned out, a ladies’ man. He took a job in law enforcement but there was a scandal. He lost his job and the publicity cost my mother her job as well. They packed up for Idaho, where my father had an older brother who ran the best bar in town and the only casino. It says on my birth certificate that he was a blackjack dealer but he lost that job soon after I was born. Something about accusing the wrong person of cheating. So it was back to the San Joaquin, minus the Navy man. Mother was smart. She found herself an Air Force man who was in for the long haul. Her life from then on was nothing but normal except that we moved around a lot. Air Force bases. Germany. Virginia. Oklahoma. Nevada. But that was how it was supposed to be so we were all fine with that. Military retirement sent us back to the San Joaquin and even more normalcy. My mother mostly worked for the federal government. NASA back when there were only seven astronauts and then for the draft board and then, for decades, Social Security. She was the office expert on everything Social Security. She knew the codes and the laws and the formulas and the exceptions and exemptions and the rest. She knew more than the bosses and didn’t mind reminding them. She was smart and quick about everything. She couldn’t cook worth a damn, but she could amortize a mortgage without a calculator and balance a checkbook in her head. As expected, old age slowly crept into her life but she put up a good fight. She exercised mightily, watched her weight. Well after becoming a senior, she volunteered at the senior center to do taxes for the seniors. Before long, she was helping seniors several years her junior. The Air Force man was gone by then, worn out by life and ready to rest. There is nothing special about the rest of this story. No surprise ending. No great lessons, but it might make me feel better and it might help someone else in the same situation, watching a loved one fade. There is one bright spot, though, and I’ll share that at the end. It took us a long time, years in fact, to recognize the signs of dementia. For the longest time, years in fact, we thought she was just repeating stories because she lived alone and didn’t have anyone else to talk to. When we visited, she had all those stories stored up, and if they were worth sharing once, they were worth sharing four or five times. 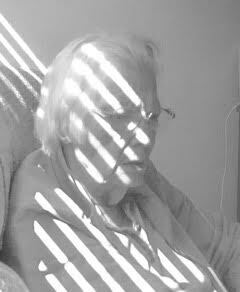 She was well into her 80s before we got wise, but she had a caregiver in the house and things seemed fine. Then the caregiver had a stroke and things weren’t so fine. We moved her north to the coast a few years ago and, in several ways, she felt it was the worst thing that ever happened to her, quite an accomplishment. She still had most of her faculties but she really didn’t understand why she just couldn’t stay in her house. The truth was, it was too far away for us to get to when we were needed, but that wasn’t a good enough reason for her. First she was in one of the larger assisted living places around, 150 units or so. Long hallways and a big dining hall with mediocre food that slowly got worse. At one lunch, I took my mother’s plate of “spaghetti” into the kitchen and asked the cook if she would serve something like that to her mother. “No, I would not,” she replied. Eventually, the place seemed too large, too impersonal, so we moved her again. This time to a much smaller assisted living place on the Peninsula. Expensive but wonderful. Great attention. Very good food. Nice people all around. The move didn’t stop her slide, though. At first, we would take her out to lunch occasionally or haul her to our house for holidays or special occasions. Eventually that became too hard when her feet and then her legs stopped paying attention to her head. From the start, she spent most of her time in her little room, smiling at the family photos on the walls and the familiar quilts and art. These days, she spends almost all of her time in her room, mostly sleeping. Very mostly sleeping. The woman who once had all the Social Security regs memorized doesn’t know where she is anymore, why she is there and why we don’t take her home, wherever that might be. A couple of weeks ago, for the first time, she wasn’t sure who I was. She introduced me to one of the caregivers as her brother. He asked her my name. She was puzzled. She got it right the next visit, however. It was her 89th birthday the other day, something she didn’t see coming and didn’t have any clue about until I showed up with a birthday cake. She was sitting up in an easy chair when I got there but she put her head down after a minute or two and went to sleep. She stirred occasionally and someone would come by and say, “Happy Birthday.” She would just smile. We fought more than a little. It seems like we both had to be right and always felt that we were even when we weren’t. She isn’t traveling any more, or if she is, she doesn’t remember it when she awakens. Her pleasures are much, much simpler now. She loves it when they polish her nails and brush her hair. I love it that they do those things often. I called my brother while I was there for her birthday and put the phone to her ear. She had no idea what I was doing. Lunch was good. Fresh salmon and birthday cake. One of the best combinations I can think of. My mother ate most of the salmon, none of the vegetables, but all of her slice of cake and part of mine. So, I guess, it was a good day after all. The good thing I mentioned earlier? It’s just this. My mother and I were never particularly close. In fact, we fought more than a little. It seems like we both had to be right and always felt that we were even when we weren’t. Life with her was a competition of sorts. She seemed to enjoy pointing out my faults, even the terribly obvious ones. Our visits were obligatory, the goodbye hugs stiff and forced. But now, now that I am responsible for helping to take care of her, for trying to make sure her ailments are treated and that she is warm and safe, I have learned to care about the wily girl from the Wasatch Range much more than I ever did growing up, more than I ever thought I could. As difficult as things can be at times, I find it to be a gift. It is hard watching her fade. The birthday lunch was not easy even with the staff lighting the candles and shooting video and singing. But I realized again on her birthday that I still owe her more than I have given her so far and I have learned to appreciate the smiles and the thumbs up and the chance to make her days as pleasant as possible. Royal, that is absolutely lovely. My experience is similar but I don’t have the eloquence to express my thoughts as you have done. Thank you, you speak for a lot of us. Heartwarming, Royal, and yes, tough. I’d like to think that she sleeps so much because her dreams are so wonderful. Thank you for the amazing story about Aunt Lila. So much I didn’t know about the family. I remember so many nights of Aunt Lila and Uncle Cal playing pinochle with Mom and Dad. They were very competitive. I enjoyed this very much. It brought tears to my eyes. Moving words, Royal. Bittersweet echoes of what so many of us are facing. You capture the mixed emotions well – the loss but also our individual calling to provide support and creature comforts, balancing the lifespan caretaking roles as best we can.